Gerry Kasten RD, MSc, FDC, an adjunct professor with the Faculty, has been chosen as the recipient of the 2018 Ryley-Jeffs Memorial Lecture Award by the Board of Directors of Dietitians of Canada (DC). The Ryley-Jeffs Award is the highest recognition that the Board of Dietitians of Canada can bestow on a DC member. Recipients exemplify dedication to the profession and a proven ability to chart new directions in the field of dietetics. Gerry loves food – it empowers all he does. For nearly three decades, Gerry has enhanced people’s lives with practical and pragmatic advice on how to enjoy the deliciousness of food to improve their health. 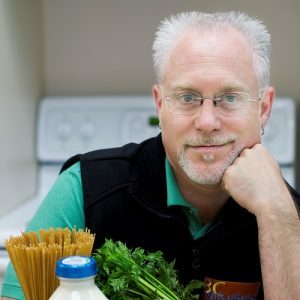 His passion for advocacy has led him to be a trailblazer in public health nutrition, culinary arts, teaching and media. Gerry will present the 2018 Ryley-Jeffs Memorial Lecture at the DC National Conference in Vancouver on June 8th, at 9 am. A video recording of the conference presentation will be available on the DC website and a version of Gerry’s lecture will be published in the fall issue of the Canadian Journal of Dietetic Practice and Research.